Morocco has long been touted as a beacon for progress in the Middle East and North Africa, especially since 1999, when King Mohammed VI ascended to the throne. Over the last 15 years, the developing country has seen the advancement of women’s domestic rights via the Moroccan Family Code, the ratification of the United Nations’ Convention on the Elimination of All Forms of Discrimination Against Women, and a variety of innovative educational reforms. In fact, the first 10 years of Mohammed’s reign were dubbed the “Education Decade,” resulting in impressive increases in literacy. UNESCO estimates that just 41.6 percent of the Moroccan population was literate in 1990; by 2010, that figure had spiked to 56 percent. But despite this long-term commitment to education and human rights, there remains a startling division in literacy rates between Morocco’s urban and rural populations—with an even more significant gap between men and women. In many ways, the urban/rural achievement gap may not be so surprising: Rural villages can be many miles away from schools; temperatures are sweltering in summer and can be freezing in winter; main roads are often crowded and in poor shape; and alternative transportation is out of reach for many poverty-stricken families. But the unique obstacles faced by many rural women and girls—who enroll in lower secondary education at a rate of 26 percent compared to 79 percent for rural boys—are considerable. For traditional Moroccan families, it’s simply not acceptable for young girls to walk to and from school alone, or to live away from home to attend school if a daily commute proves taxing. While illegal, underage marriage remains a reality for many Moroccan girls, and often eliminates any potential for a secondary education. Some estimates claim that even five years post-“Education Decade,” illiteracy rates for rural women and girls in Morocco remain as high as 90 percent (though official sources put the figure at 54.4 percent). Still, a pragmatic optimism lingers in Morocco, as a variety of policies and programs actively target illiteracy to this day. The nation’s longest-established literacy program—mahou al omiya (Erasing Illiteracy)—directly tackles the rural gender gap each night in the classroom. This free program, held in the evenings at nearly every public school in the country, is geared toward adults who never had the opportunity to attend or complete school. Open to attendance by both men and women, it’s women who are most in need of literacy support—so it’s women who most often attend. Mahou al omiya has been a particular boon to parents of school-age children, who in addition to receiving literacy instruction, are put in direct contact with school administrators—easing any tension they may have about enrolling (and keeping) their children in school until matriculation. The program counteracts one of the biggest causes of intergenerational illiteracy by giving parents who attend the knowledge and skills to help their children with their own studies. Though awareness of mahou al omiya is unparalleled, it isn’t a blanket solution for every situation—it’s just as much of a challenge for rural adults to attend distant public schools as it is for their children. To counter transportation difficulties, King Mohammed VI recently launched a literacy program delivered 24 hours a day online and on television via Assadissa (Channel 6), as well as through tutors and support classes at mosques throughout the country. His Majesty’s program includes basic Arabic reading and writing, mathematics, and Qur’an and religious studies. When the program launched in 2000, there were 200 participating mosques. By 2013, that number had sky-rocketed to 4,800. Perhaps because religious studies are such an important part of the Islamic faith, combating illiteracy through mosques has gained a great deal of traction. The Moroccan government has also leveraged the nation’s religious infrastructure through the murchidates, or female spiritual guides. 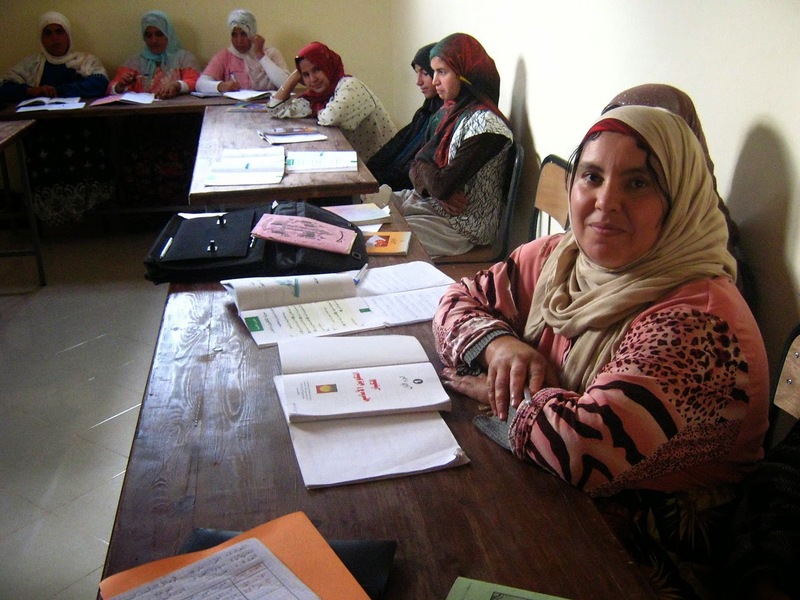 Interested women are given the opportunity to train, then are free to advise other women and girls within their communities on a variety of civic and spiritual issues—whether that means informing them about their equal marriage, divorce, and property rights under the Moroccan Family Code, or providing literacy education and religious guidance. The murchidates have been empowered to do everything that male clergy do, other than lead prayers—allowing them to seamlessly integrate themselves (and their progressive ideas) into their communities, while addressing knowledge gaps between the privileged and disadvantaged. Over the course of 300 hours, women at one of the country first adult education centers—The Maison de Citoyenneté (Citizenship House)—develop basic reading, writing, and numeracy skills. Along the way, they pick up social and civil rights knowledge and have the opportunity to take part in income-generating activities like weaving and beekeeping. Since its inception in 2007, The Maison de Citoyenneté has benefited over 20,000 women and girls, whom UNESCO has praised as beeing exceptionally “liberated” and “highly motivated,” many of them eager to send “their out-of-school daughters back to school” and subsequently provide them with solid educational support. Far from a failure, Morocco’s “Education Decade” has proven to be the beginning of a very long journey. Change never happens overnight, and the nation’s commitment to education should serve as an example of astonishing progress. Of course, it’s also living proof of the considerable hurdles faced by illiterate individuals all over the world. There are 800 million of them, by the way—two-thirds of them women and girls. But by following Morocco’s lead—making women and girls a central focus of our efforts around the world—we can all be well on our way to eliminating illiteracy everywhere.